The Colin Tizzard-trained 4/1 shot Fox Norton, was an impressive six-length winner of the G1 JLT Melling Chase at Aintree. Travelling ominously well entering the home straight under Robbie Power, the seven-year-old son of Lando produced a superb leap at the final fence and showed a potent turn of foot to register a decisive success. Henry de Bromhead's Sub Lieutenant (10/3 favourite) was second, with a further 11 lengths back to Gary Moore's Traffic Fluide (14/1) in third. Tizzard, Power and owners Alan & Ann Potts were registering an 84/1 double on the day following Pingshou's victory in the G1 Crabbie's Top Novices' Hurdle. A head second in the Betway Queen Mother Champion Chase at the Cheltenham Festival, Tizzard was delighted with the gelding's performance when stepped up in trip. Tizzard said: "It is lovely it is happening. We had a quiet old time in the run up to Cheltenham and then it was hard work at Cheltenham. We are in good form again. "Fox Norton could have won the Champion Chase - there wasn't much in it at the line. He has got better for the trip today. "We thought about running him in the Ryanair. It took him all over two miles to get into third in last year's Arkle and he is not very fast at home. Honestly, being nearly a champion two-miler you would think he will be fast but he is not. "I think he could make up into a King George horse. He stayed that trip today and Joe [Tizzard, assistant trainer] and Robbie both think he is one we could go to the King George with." Winning owner Alan Potts said: "Everything is going good. He should have won the Champion Chase and he didn't get up by a head. We think he will get a longer trip than this. "Robbie Power who I have made our number on jockey, he thinks he will comfortably get three miles so we will have to see." Betway made Fox Norton a 16/1 chance for the King George and a 10/1 shot for both the Queen Mother Champion Chase and the Ryanair Chase at next year's Cheltenham Festival. The Gigginstown House Stud-owned eight-year-old Sub Lieutenant finished second behind Fox Norton. Trainer Henry De Bromhead said: "I'm delighted with him. It was a super run and he was just beaten by a quicker horse on the day, sadly. 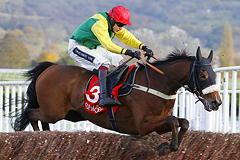 He will most likely go to Punchestown next, but I'm not sure whether he will run over two miles or three." Jockey Bryan Cooper could offer no excuses after Sub Lieutenant who has now finished second in three Grade Ones this season (in the Ryanair Chase at the Cheltenham Festival behind Un De Sceaux and the John Durkan Memorial Punchestown Chase behind Djakadam). Cooper thought that the Henry De Bromhead-trained gelding was beaten by a better horse on the day. "He's run well - he's a consistent horse but was just beaten by a better horse today," said the jockey. "There might be some improvement if we step him up in trip next season - he's certainly worth a go at further."